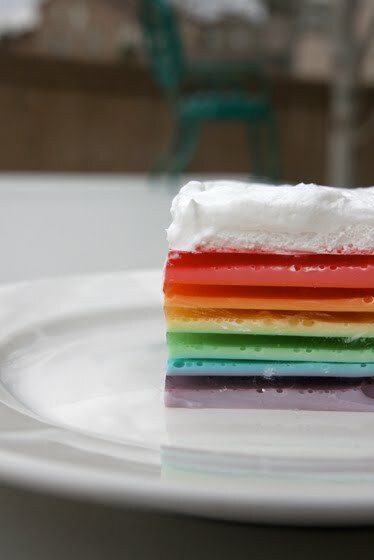 Tangled and True: rainbow jell-o. I must admit, I think that rainbow cupcakes are getting an unfair amount of attention. Not that I haven't made them, because I have, but I would like to introduce you to the less popular rainbow Jell-O… I'm hoping it overtakes the rainbow cupcake in popularity, because it's just soo good. I know what you're thinking, Jell-O? Good? but I'm asking all my friends who have had the pleasure of trying the rainbow Jell-O to help me out and verify that it is indeed really yummy. And, while it may look labor intensive, it's really not that bad. Each layer takes about 5 minutes to make, and if you spread it out over a day or two when you have a minute here or a minute there, it doesn't feel at all like you've been slaving in the kitchen for days to make it, but the end result is very impressive. I think it would make the perfect addition to your "green" dinner tomorrow night. Boil one cup of water. 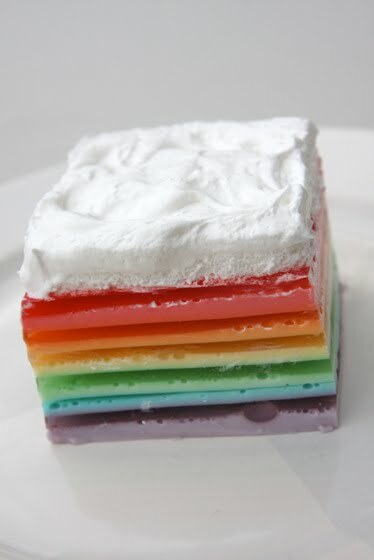 Add one package of Jell-O (this is your bottom layer.. so to make the rainbow, purple) allow Jell-O to disolve. Pour 1/2 cup of Jell-O mixture into a separate bowl and whisk in 1/3 cup sour cream. Pour into bottom of 9x13 pan and refrigerate. Add 3 Tbsp of ice water to Jell-O mixture still in the pan and leave sitting on the counter. After first layer has set up (approx 20-25 minutes) pour remaining Jell-O on top of cream layer and refrigerate until set. Repeat, Repeat, Repeat, Repeat, Repeat, Top with Whip Cream and serve. I will vouch. It is not just eye candy, it is really yummy! I especially like the repeat, repeat, repeat, repeat, repeat part. My aunt makes this and it is delicious, but she uses condensed milk instead of sour cream. Sour cream or whipped cream?? Sour cream with jello seems strange to me, but I just might not be using enough imagination! It's beautiful though - I'd love to give it a try! It is sour cream mixed in with the layers and then whip cream on the top. it may sound weird, but it is really good! I made it yesterday and it was fabulous!!! My mother-in-law makes it all the time. Delicious. I think she uses sweet and condensed milk for the creamy layers..